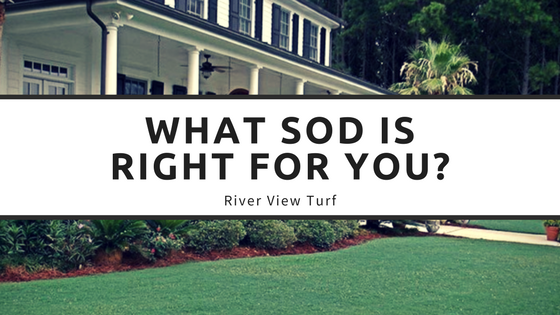 What Sod is Right for You? Installing high quality sod is the best solution to obtaining a beautiful lawn that requires low upkeep! Before you take this step, there’s a few questions you need to consider such as: climate conditions in your area and how much shade your yard receives. If you want to choose the right sod for your area, be sure to follow the guidelines below. It is important to let your sod installer know how much shade your lawn gets. If your yard gets partial shade, it can mean the world of a difference compared to a lawn that stays fully shaded. Some turf types grow better in shaded areas as opposed to others. For example, most varieties of St. Augustine are shade tolerant. If you are looking to add sod to a high traffic area, you will need a grass that is durable. For instance, in the South, Bermuda Grass is preferred because of its ability to receive quickly from wear. If you live in the Southern Zone of the United States where summers are hot and winters are moderate, you will need a warm season grass. Warm season grasses include St. Augustine, Bermuda, Centipede and Zoysia. If you are located in the Northern Zone of the US where summers are moderate and the winter is cold, you will need a cool-season grass. Cool season grasses include Kentucky Bluegrass, Perennial Ryegrass and Tall Fescue. Once you have installed your new sod, you need to be sure to maintain it in order for it to maintain its beauty. Watering your lawn often is essential, but this task can grow to become a burden. Rather than doing it yourself, you can install sprinklers or an irrigation system in your lawn that has a time activity. Does the Type of Grass Really Matter? To answer this simply, yes the type of sod you purchase matters tremendously! Each grass species is available in varieties that offers a variation in texture, color and growth rate. Although the visual difference may be subtle, the advantages are usually unseen. For instance, some types of sod are more tolerant of pets, diseases or harsh weather. No-name or generic seed may be cheaper, but is usually not worth the savings because you typically end up with more problems. If you have any further questions about what sod would be best for your lawn, give us a call at River View Turf. We will be more than happy to help point you in the direction we think is best for your home lawn!